To monitor the gases, the project requires reliable continuous gas monitoring equipment for unsupervised monitoring of the emissions over the course of the three years. 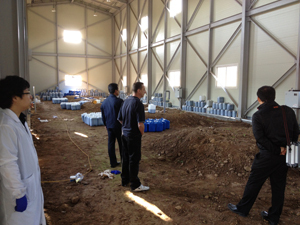 Three Geotech GA3000 fixed biogas analysers from local suppliers were chosen for the job. The Geotech GA3000s are monitoring levels of CH4, CO2, O2 and H2S coming from within the graves. Temperature is also of interest to the researchers and is being monitored with a separate device. The GA3000 has since been superseded by the GA3000 PLUS. Both offer reliable monitoring of CH4, CO2 and O2 as standard. The GA3000 PLUS can monitor both high and low range H2S, and now has new Profibus communications. - Source.